"Stage set for a film #1 by artist Dennis Oppenheim"
An image of the sculpture Stage Set for a Film #1 on the campus of the University of Northern Iowa in Cedar Falls, Iowa. 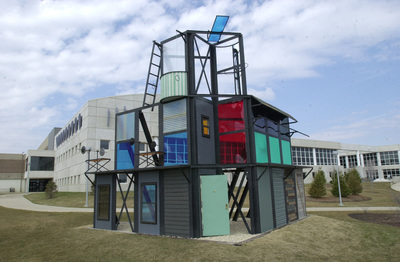 The sculpture was installed in 2000 and is an Iowa Art in State Buildings Project commission. The medium is steel, mixed-media, and found objects. "Stage set for a film #1 by artist Dennis Oppenheim" (2019). Art on Campus Photographs. 22.